Recently, I was asked to attend the KIC Think Tank. It was a few days in Ohio last week with other incredible bloggers at Kroger's innovation kitchens to talk about what Kroger is doing to end hunger and what we can do with our platforms to participate. I love the brands we get to work with, but I have to be honest: There is something very special about what this grocery store giant is committed too. "Zero Hunger, Zero Waste" is an initiative dedicated to ending hunger and grocery store waste. 40% of all food in America is thrown out, unused, uneaten, while 1 in 8 Americans are food insecure and go without the food they need. I am partnering with Kroger to do what I can and use up every last bit of food I purchase, shelve, and refrigerate. It is an incredibly worthwhile endeavor. While we were there, Kroger hosted a blogger cook-off. We all chose a dish to cook that was fresh and simple and would inspire folks to get cooking in their own kitchens. 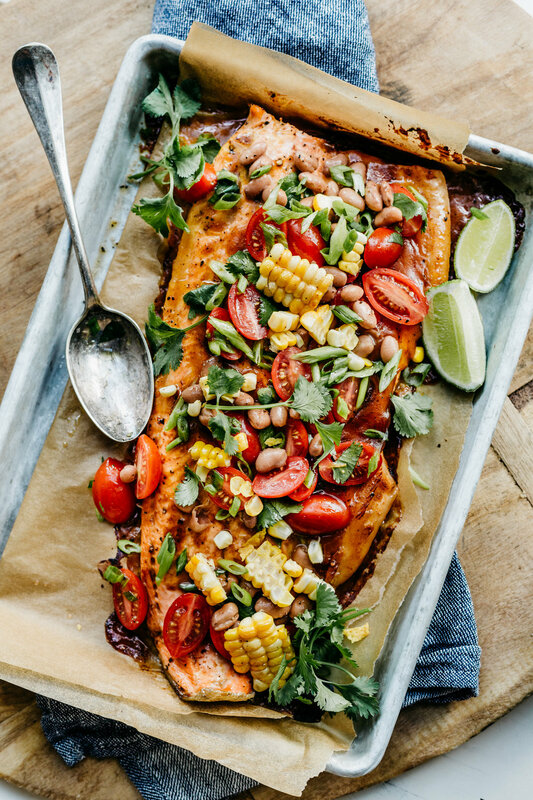 I came up with this salmon recipe to bring something simple and fresh to the weeknight dinners game. I love a fuss-free salmon recipe. 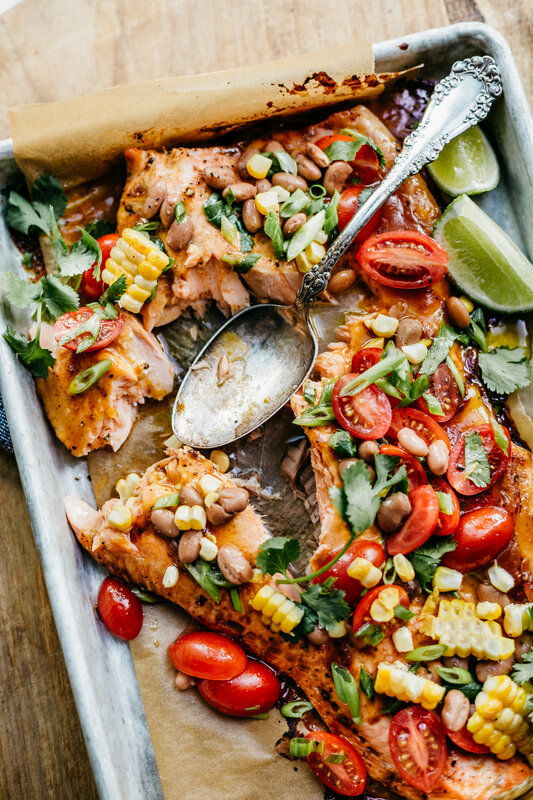 I hope you make this and 14 other salmon dishes just like this one for your family. By the way, all ingredients were purchased at my favorite Kroger grocer, Fred Meyer -- they're the best! Click here to find a Kroger store near you! Preheat oven to 425 degrees. Prepare all the garnishes. Line a baking sheet with parchment. Lay the whole salmon filet onto the parchment-lined sheet and set aside. Take care to remove all the bones. Mix the BBQ sauce and pour half over the salmon filet. Bake the salmon for 20 minutes or until the fish is cooked completely. Once the salmon has finished cooking, sprinkle all the garnishes over top and serve directly from the pan. Serve over mixed greens and top with lime juice. To char the corn, grill the cob on all sides in a grill pan or under the broiler. Slice off the cobb and use for topping the salmon. Enjoy!